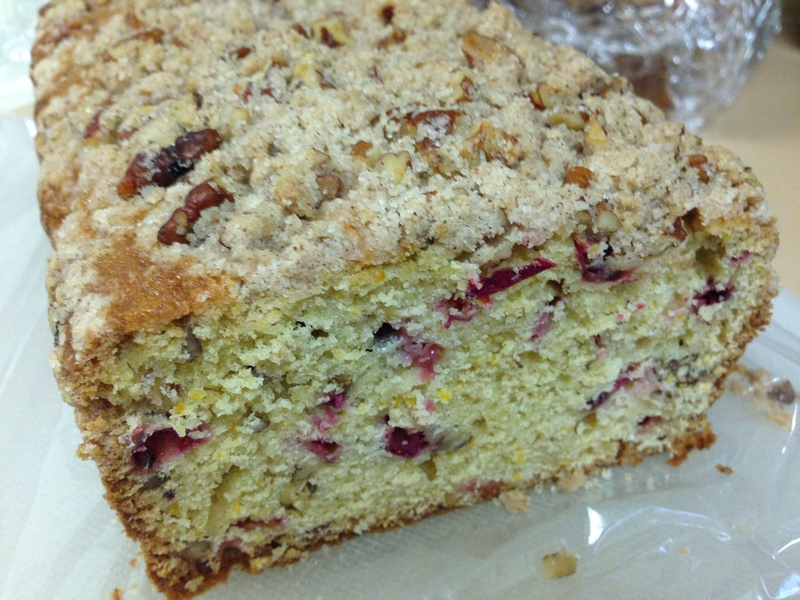 Cranberry orange pecan coffee cake sounded like the perfect Christmas treat! I made this on Christmas Eve and it was perfect with coffee on Christmas morning. The great thing about this recipe is that it makes TWO loaves. One for me and one to wrap up and give to Vince’s grandma for Christmas. This loaf was perfect…not too sweet, with a nutty crunch, and the perfect amount of orange and cranberry in every bite. 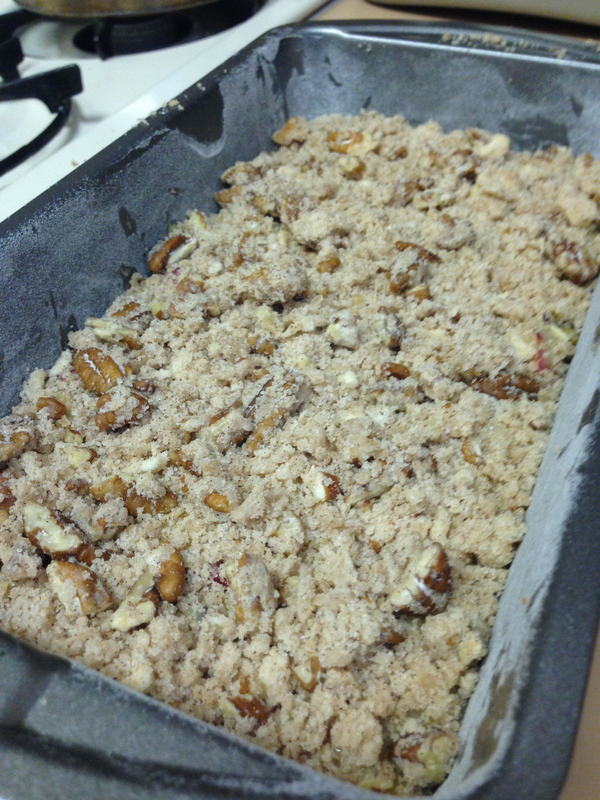 The pecan crumble topping was the perfect touch! 1. Place a rack in the center of the oven and preheat oven to 350 degrees F. Grease two 9×5-inch loaf pans. Line loaf pans with parchment paper, leaving a few inches of overhang on each side. Grease the parchment paper and dust with flour on all sides. Set aside. 2. In a large bowl, whisk together flour, sugar, baking powder, baking soda, and salt. Add chunks of butter and work the butter into the flour with your fingers. Try to blend the butter into each bit of the dry ingredients. The mixture will resemble a coarse meal. 3. In a medium bowl whisk together eggs, orange juice, orange zest, and vanilla extract. 4. Add the wet ingredients all at once to the dry ingredients. Stir together to incorporate. 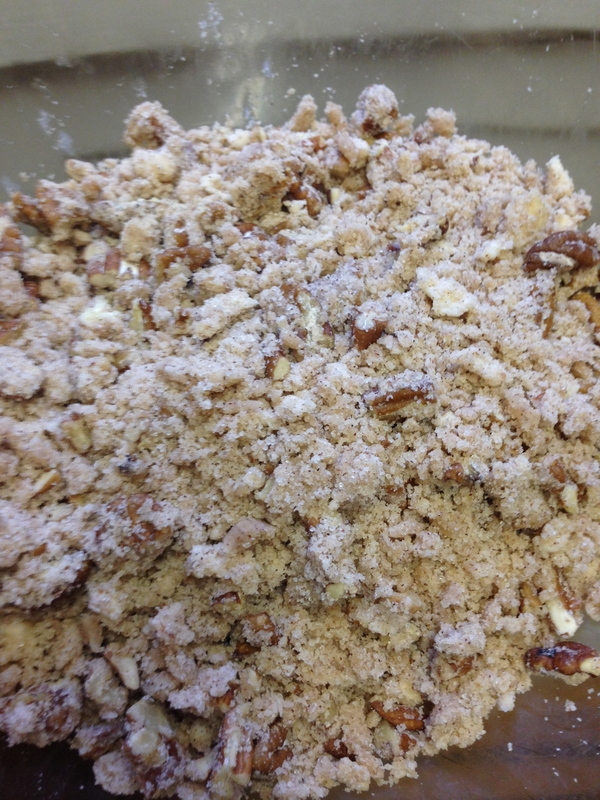 Add the cranberries and pecans and carefully fold into the batter. 5. 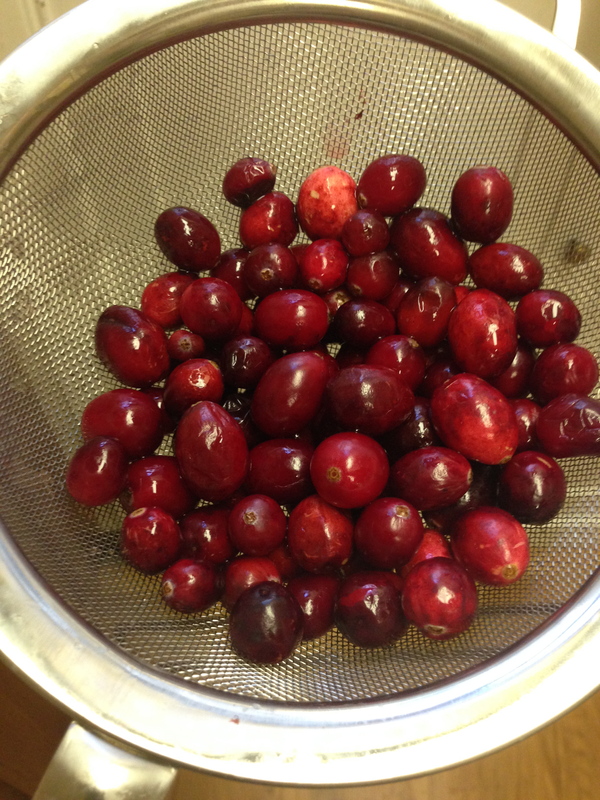 To make the topping, combine all of the ingredients in a bowl and rub together with your fingertips until crumbly. 6. 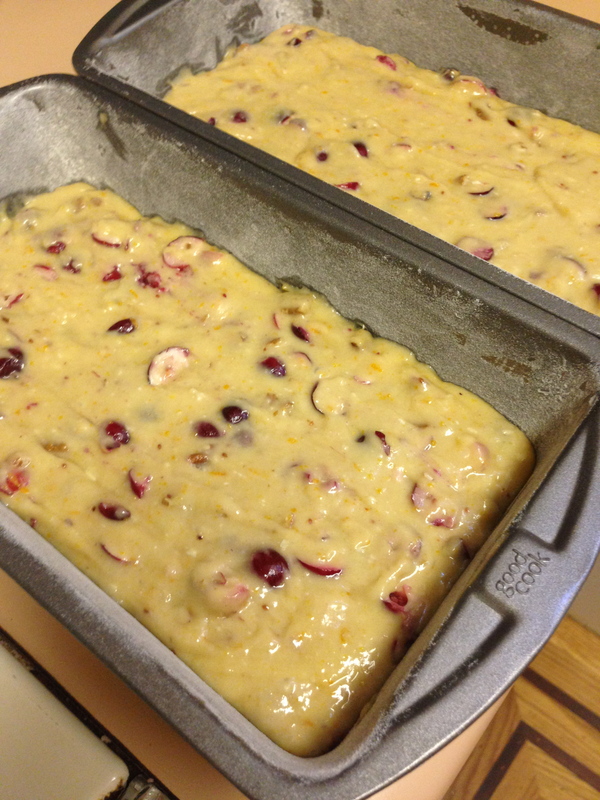 Divide the batter between the two loaf pans. Sprinkle each loaf with topping. Bake until loaves are golden brown and the center is cooked through. Insert a skewer or toothpick into the center of the cake to ensure that it’s cooked through, about 50 to 60 minutes. 7. Remove from the oven and allow to cool in the pans for 15 minutes. Use the parchment paper to life the loaves from the pan and allow to cool further on a wire rack. 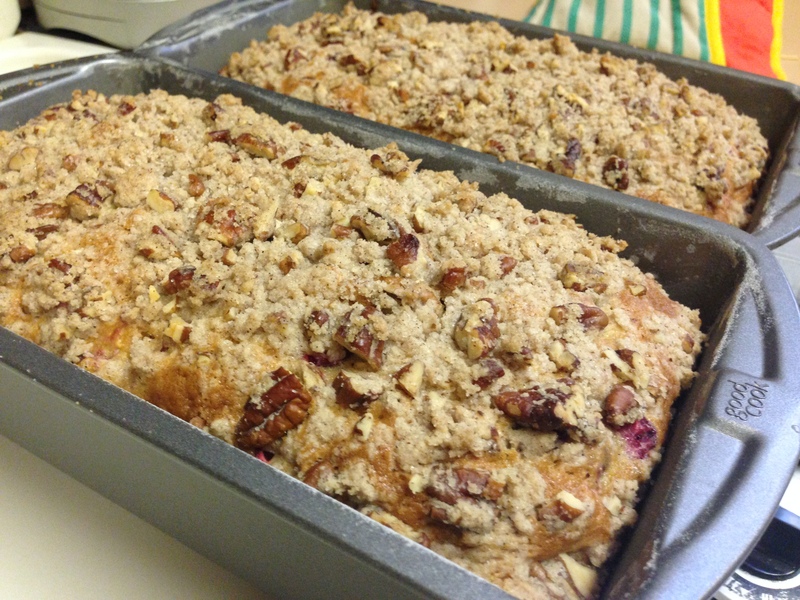 This cranberry bread is the best! And very pretty too!